Introduction: Potassium is the most abundant cation in intracellular compartment. A deficiency or excess of its serum concentration can be deleterious to the one suffering from a cardiac ailment. Post cardiac surgery patients are often on multiple drugs like angiotensin receptor blockers (ARBs), angiotensin converting enzyme inhibitors (ACEI), diuretics including potassium sparing diuretics which are known to predispose for hyperkalemia. We report two postoperative cases who developed life threatening hyperkalemia despite normal renal function due to a combination of factors like treatment with ACEI, potassium sparing diuretics, high dietary intake of potassium and we also discuss renal handling of potassium in this review of literature. Methodology: We present a case series of two cases of cardiac surgery, who presented in the emergency department with hyperkalemia, managed conservatively and detailed history revealed that patient were also on very high nutritional potassium. Result: Both the patients responded to conservative management and there was no recurrence of such episodes once the dose of diuretics was adjusted and diet modification advised. Conclusion: In India, many patients are from a low socioeconomic background and often resort to cheap and filling food items like bananas. This dietary factor should be kept in mind while prescribing patients with these medications and adequate counseling regarding diet should be done. Hyperkalemia is a potentially life-threatening electrolyte abnormality. Hyperkalemia is a known complication of the use of angiotensin-converting enzyme inhibitors (ACEI) or angiotensin receptor blocker (ARB). Incidence of hyperkalemia with ACEI or ARB therapy was found to be more among persons with lower estimated glomerular filtration rate (eGFR). It has been described previously that hyperkalemia develops in about 10% of outpatients with chronic kidney disease within a year of ACEIs being prescribed. A recent large study found that among persons with eGFR <30 mL/min/1.73 m2, new users of ACE-I or ARB therapy had a 55% and 29% 1-year occurrence of potassium >5 and >5.5 mmol/L, respectively. In those with preserved renal function, potassium >5 mmol/L occurred in 5.6% and potassium >5.5 mmol/L occurred in 1.7% of patients. Role of high dietary intake of potassium for causing hyperkalemia in addition to these factors in patients with normal renal function has seldom been reported. Here, we are reporting two cases with severe hyperkalemia during combined therapy with ACEI and spironolactone who neither had compromised renal function nor were diabetic or in CHF at the time of discharge. Both were young patients who were taking large amount of bananas on a daily basis, a fruit rich in potassium. 36 year old female patient weighing 36 kgs, height 152 cm, admitted to our hospital with diagnosis of rheumatic heart disease, severe mitral stenosis (MS), severe aortic stenosis (AS), and severe tricuspid regurgitation (TR). The patient had dyspnea on exertion for the last 1½ years, with recent deterioration to dyspnea of New York Heart Association Class III. She was admitted with CHF 7 months back and managed conservatively. On examination, the patient had a pulse rate of 100 beats/min (bpm) in atrial fibrillation rhythm, mild pallor, and icterus, and pedal edema was present. Cardiovascular examination findings were suggestive of MS and AS. Hepatomegaly was present. She was started on tablet furosemide 40 mg once daily (OD) along with tablet metoprolol 25 mg twice a day. She was operated and mitral valve was replaced with size 27 St. Jude's mechanical valve and aortic valve with size 17 regent mechanical valve. Tricuspid commissurotomy was performed. Immediate postoperative period was uneventful and all predischarge investigations were within normal range. She was discharged on the postoperative day (POD) 9 with prescription of tablet furosemide 40 mg OD, tablet aldactone 100 mg OD, tablet ramipril 5 mg HS, and tablet amiodarone 200 mg OD, and ecosprin 150 mg OD. On discharge, the patient did not have pedal edema or hepatomegaly. On POD 28, her medication was changed to furosemide with spironolactone 40/25 mg BD, tablet acenocoumarol, tablet aldactone 100 mg OD, and tablet digoxin 0.25 mg OD. High dose of diuretics was used for a short while as the patient still had features of fluid overload. Postoperative echocardiography showed normal prosthetic valve function with normal biventricular function and moderate TR. On POD 33, she presented in the emergency department with complaints of loose stool and vomiting (3 episodes) with severe muscular weakness. On examination, pulse was 36 bpm, irregular, systolic BP 60 mmHg, extremities were cold and clammy, signs of dehydration present, peripheral pulses not palpable, valve click present, and tender hepatomegaly present. Serum electrolytes showed hyperkalemia with serum potassium of 7.87 meq/L, hyponatremia with serum sodium 129 mmol/L and hypocalcemia, hemoglobin 9.6 gm% and hematocrit 38%, pH 7.28, base deficit-11, serum osmolality 252 mmol/L, serum creatinine 1.1 mg%, and blood urea nitrogen (BUN) 17 mg/dl. Electrocardiograph (ECG) showed heart rate of 30 beats/min, broad QRS complex, tented T-wave, and impending sine wave pattern. When detailed history was elicited from her husband, he revealed that apart from her medication, she was taking 7–8 bananas every day as part of her regular diet for the last 3 weeks. She was managed with aggressive antihyperkalemic treatment with intravenous (IV) calcium gluconate, glucose-insulin drip, soda-bicarbonate, loop diuretics, K+ binding resins, and IV fluids. Over 24 h, she was stabilized in the intensive care unit (ICU) with same treatment. Hemodialysis was not required, she recovered hemodynamically and maintained good urine output. Potassium levels were serially monitored and were on a decreasing trend and finally levels decreased to 4.5 meq/L. ECG showed normal sinus rhythm, rate of 80–90 bpm. She was discharged from ICU after 2 days. She was advised to eat 1–2 bananas every day and the dose of potassium-sparing diuretics was reduced. She remained in a regular follow-up and no such incidence recurred. 8 years old child weighing 21 kgs, height 130 cm, admitted to our hospital with diagnosis of tetralogy of Fallot physiology for intracardiac repair. Examination showed a cyanotic child with pulse rate of 78 bpm in sinus rhythm and blood pressure of 100/70 mmHg. Preoperatively, the patient was continued on tablet propranolol 10 mg 8th hourly. Perioperatively, dacron patch closure of ventricular septal defect, infundibular resection done, and transannular bovine pericardial patch placed. On POD 1, the patient developed complete heart block and was treated with temporary pacing, and injection dexamethasone was started, which was tapered off gradually and stopped on POD 10. Other medications included tablet furosemide 20 mg OD and tablet captopril 12.5 Mg 8th hourly. For nutrition, he was adviced to include banana in the diet. Gradually over next week, the patient developed hepatomegaly and weight gain of 4 kg and was started on tablet aldactone 25 mg BD. The patient was then discharged on POD 15 after features of CHF were relieved. On POD 21, he presented in the emergency department with nausea and vomiting, electrolytes showed K+ of 7.12 meq/L, Na+ 121 meq/L, serum creatinine 1.2 mg%, and BUN 15 mg%. ECG showed hyperkalemic changes. He was shifted to ICU and antihyperkalemic treatment started that included IV calcium gluconate, sodium bicarbonate, glucose-insulin drip, and potassium-binding resin. He was maintaining good hemodynamics with adequate urine output. Potassium levels were serially monitored and after 24 h of aggressive management, his K+ level was 4 meq/l. Dialysis was not required. He was discharged from ICU after 2 days. Retrospectively on interrogating further his father said that the boy was eating at least 6–7 bananas every day for the last 15 days. He was advised to eat a single banana every day and he remained in regular follow-up and had no such episode again. Potassium is the most abundant intracellular cation. Only 2% of body K+ is extracellular. An average 70 kg man has about 3500 mEq of K+. Plasma K+ is freely filtered at the glomerulus and most of it reabsorbed in the proximal convoluted tubule (PCT) and loop of Henle (LOH). K+ is secreted in the distal convoluted tubule (DCT) and collecting duct. [Figure 1] shows K+ handling by the kidney. K+ is freely filtered at the glomerulus. At PCT: 65% is reabsorbed here by solvent drag mechanism along with NaCl and water and also enters through the paracellular pathway. At thick ascending LOH: K+ enters the cell from the lumen along with Na+ and two Cl− ions through the Na+–K+–2Cl -cotransporter and through paracellular pathway. Some of the K+ is secreted into the lumen through the renal outer medullary potassium (ROMK) channels. This is promoted by increased intracellular K+ concentration from the 3Na+–2K+ ATPase channel that uses ATP and shifts two potassium ions inside cell and three sodium ions outside the cell across the basolateral membrane, keeps intracellular environment more electronegative, and promotes more Na+ reabsorption. Early DCT: Here sodium and chloride continue to get reabsorbed by thiazide sensitive Na+–Cl− cotransporter. Potassium is secreted into the lumen through ROMK channel. Activity of both these channels is enhanced by the 3Na+–2K+ ATPase channel that increases intracellular potassium concentration and decreasing intracellular sodium ion concentration. Late DCT and cortical connecting tubule and cortical collecting duct: Two types of cells are present here: (1) Principal cells: here potassium secreted into the lumen majorly by ROMK channels and K+ maxi conductance channels. Minor pathway is K+–Cl− cotransporter that shifts both potassium and chloride ion from the intracellular compartment into the lumen. Here, epithelial sodium channels (ENaC) are also present that shift sodium from the lumen to inside the cell; this helps in maintaining electronegative environment in immediate vicinity of cell that favors potassium secretion. These channels are blocked by potassium-sparing diuretics (ENaC blocker, e.g.,: Amiloride). (2) Intercalated cells (IC); type A/acid/H+ secreting IC: here, potassium uptake inside the cell from the lumen is done with the help of K+–H+ exchanger where one potassium ion is exchanged for one hydrogen ion. Hydrogen ion is made available by break down of H2 CO3 into H+ and HCO3−. HCO3- is reabsorbed at basolateral membrane with a chloride exchanger and hydrogen ion is exchanged with potassium. 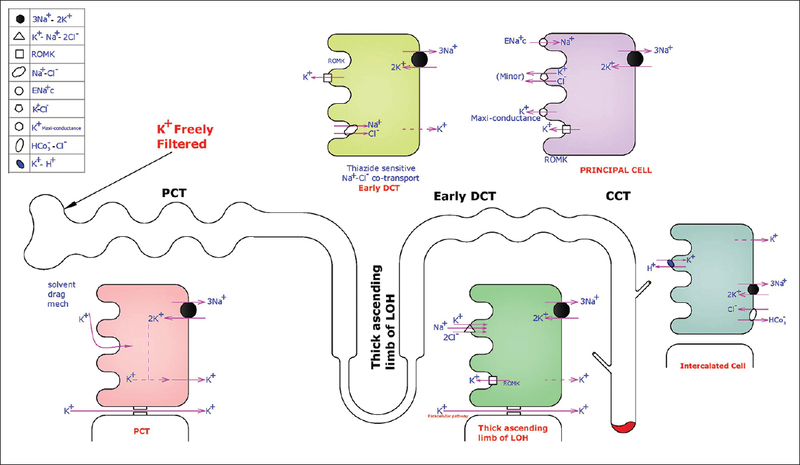 Distal K+ secretion is regulated by aldosterone, acid–base status, the rate of urine flow in DCT, and membrane polarity [Figure 2]. High circulating aldosterone levels lead to increased K+ secretion and kaliuresis. Deficiency or suppression of aldosterone decreases distal K+ secretion and results in renal K+ conservation. Increased delivery of sodium to DCT and high distal nephron urine flow rates favor potassium excretion. Reabsorption of sodium in DCT causes luminal electrical negativity further increases potassium secretion. Hence, loop diuretic therapy or high intake of sodium is associated with increased secretion of potassium. Rabinowitz in his classical article on aldosterone and potassium homeostasis, described four basic mechanisms of potassium secretion. First, aldosterone as a kaliuretic hormone, especially in the presence of hyperkalemia. Second, plasma potassium itself acts as homeostatic regulator of potassium excretion. It was further added by Young in his paper in this regard that a very small change in potassium excretion occurred when plasma potassium concentration was changed over its normal physiologic range. Rabinowitz also stated that potassium receptors exist in some regions of gut, liver, and the portal circulation, which respond to local increase in potassium concentration, thus initiate a reflex kaliuresis (involves brain and undetermined kaliuretic regulatory factors), third mechanism of potassium secretion. Fourth factor described is a physiologic circadian rhythm in K+ excretion driven by an oscillator in the brain. It is independent of cyclic K+ intake, adrenal hormones, changes in plasma K+, renal nerves, and sodium cyclic excretion. The efferent factors connecting brain and kidney are not known yet. Aizman and Rabinowitz in their review found evidence connecting certain receptors in the brain and renal potassium excretion. Homeostatic mechanisms to maintain normokalemia are highly effective in normal individuals and capacity of renal potassium excretion is very high. Hyperkalemia is practically always associated with impaired urinary potassium excretion in patients with acute or chronic renal failure where high potassium intake can contribute to the development of hyperkalemia. Drugs: Digitalis overdose, succinylcholine, arginine, heparin. Pseudohypoaldosteronism (hereditary or acquired resistance to aldosterone). Hans Schepkens et al. studied 25 patients admitted with K+ >6, with combination therapy and on admission serum creatinine was found to be in the range of 3.8 ± 1.8 mg/dl with metabolic acidosis. Main cause of renal failure was dehydration and worsening heart failure. Daily dose of spironolactone was 57 ± 32 mg. Two patients died, 17 patients required hemodialysis. They concluded that combination of ACEI and spironolactone should be considered with caution and monitored closely in patients with renal insufficiency, diabetes, older age, worsening heart failure, risk of dehydration, and combination with other medication that may cause hyperkalemia and daily spironolactone dose should not be exceeded beyond 25 mg.
Ahuja et al. found main predictors of hyperkalemia were the presence of diabetes and increasing renal insufficiency. Diabetics with renal failure usually have hyporeninemic hypoaldosteronism predisposing them to development of hyperkalemia with ACEI. ACEI by blocking the production of angiotensin II and therefore aldosterone leads to retention of potassium and hyperkalemia more marked in patients with renal insufficiency. They also found CHF to be a predictor of hyperkalemia as it leads to decreased delivery of sodium to the distal tubule for exchange with potassium and hence causes K+ retention. In a study population of 1818 patients with ACEI, 11% prevalence of hyperkalemia was found by Reardon and Macpherson. An elevated BUN level (>18 mg%), creatinine level (>1.6 mg%), and CHF were strongly and independently associated with hyperkalemia. An additional increased risk of hyperkalemia was observed with use of long-acting ACEI. Reduced risk was observed with use of thiazide and loop diuretic agents. Therefore, conditions that may lead to the development of severe hyperkalemia in patients with heart failure who are taking spironolactone and ACE inhibitors or ARBs include: advanced age, dose of spironolactone >25 mg daily, reduced renal function, and DM Type 2. Dietary component can play a major role in causing hyperkalemia when it is combined with other factors such as potassium-sparing diuretics even in patients with normal renal functions. Food items with high potassium content include fruits such as kiwi, bananas, orange; vegetables such as potatoes, avocados, turnip, dried peas, dairy products, meat, nuts, and apricots; and certain herbal products (e.g., noni juice, Siberian ginseng, dandelion). ROMK and maxi-K channels are also localized in the cytoplasm, and their trafficking to apical membranes in distal tubules is regulated by dietary K+. Eric Williams and Fulop reported a puzzling case of hyperkalemia in 2001 in a patient with a history of stable chronic kidney disease on tablet lisinopril who was admitted with recurrent hyperkalemia. He had a history of taking 2.5–4.5 L of apple juice per day that added about 60–120 mmol/day of potassium to his body. Other juices having higher potassium concentrations includes pineapple, grapes, and orange juice. Pavletic reported a case of hyperkalemia induced by excessive consumption of dried fruits (figs) in an otherwise healthy female secondary to a psychiatric eating disorder. In a third world country like India where our patients can not afford to eat dry fruits or other expensive nutritious fruit and supplements, banana is available as good cheap option. About 100 g of figs would cost about 120–150 rupees in India while 100 gms of banana would cost around 8–10 rupees. Banana is a healthy and cheap fruit that is also good for maintaining regular bowel movements and satiety. It is rich in potassium, magnesium, iron, and Vitamin B6 and C. Hence, most of our population resorts to eating bananas on a daily basis, especially postoperative patients who are adviced to maintain a good, healthy diet enriched with fruits. In both our cases, there was a history of intake of large amount of potassium-rich fruit, mainly banana about 6–8/day. Each banana (weighing about 150 g) consists of 15.2 mmol of potassium according to a food composition cart. Eating 6–8 bananas will add about 91–121 mmol of potassium. The WHO recommends potassium intake of about 90 mmol of potassium per day for an adult. In our patients, probably the high intake of bananas along with other food items and potassium-sparing diuretics led to life-threatening hyperkalemia despite normal renal function. Our first patient was a young lady, nondiabetic with normal renal function; she was not in CHF at the time of discharge but developed severe hyperkalemia and presented with three episodes of vomiting and diarrhea. She was taking combination therapy of ACEI (ramipril 5 mg OD) along with furosemide and potassium-sparing diuretics (a slightly higher dose as patient had features of fluid overload). On taking dietary history, it was found she used to take 6–7 medium-sized bananas daily since her valve replacement (potassium-rich diet). ACEI causes hypoaldosteronism and decreased potassium secretion, along with potassium-sparing diuretics and rich potassium diet, all three factors culminated in hyperkalemia which causes decreased GFR and more potassium retention in the body. The second patient was a child who underwent TOF repair, developed severe hyperkalemia following combined therapy with captopril, potassium-sparing diuretics, aldactone 100 mg OD, and dexamethasone (for complete heart block). Interestingly, he was very fond of banana and used to eat 5–6 medium-sized bananas daily. One medium-sized banana contains very rich amount of potassium, approximately 11% of daily requirement. 5–6 banana added ample amount of potassium in his diet (50% daily requirement). Transient adrenal suppression from dexamethasone withdrawal may cause decreased synthesis of cortisol, along with ACEI, marked hypoaldosteronism can occur. He also received potassium-sparing diuretics as well as very high potassium-rich diet; all these factors culminated to severe hyperkalemia despite normal renal function. Hence, we conclude that life-threatening hyperkalemia can occur in postoperative cardiac surgical patients when the patients have a combination of predisposing factors like treatment with ACEI/ARB in combination with potassium-sparing diuretics and taking a diet rich in potassium in excess of the recommended dose, despite normal renal function. History of taking a potassium-rich diet (in excess of recommendation) may often be missed, and this article attempts to highlight the importance of all the contributing factors along with this lesser known and discussed entity. Espinel E, Joven J, Gil I, Suñé P, Renedo B, Fort J, et al. Risk of hyperkalemia in patients with moderate chronic kidney disease initiating angiotensin-converting enzyme inhibitors or angiotensin receptor blockers: A randomized study. BMC Res Notes 2013;6:306. Bandak G, Sang Y, Gasparini A, Chang AR, Ballew SH, Evans M, et al. Hyperkalemia after initiating renin-angiotensin system blockade: The Stockholm creatinine measurements (SCREAM) project. J Am Heart Assoc 2017;6. pii: e005428. Wu CT, Wang ZH, Li ZQ, Wang LF. Effect of spironolactone on cardiac remodeling after acute myocardial infarction. World J Emerg Med 2013;4:48-53. Abbas S, Ihle P, Harder S, Schubert I. Risk of hyperkalemia and combined use of spironolactone and long-term ACE inhibitor/angiotensin receptor blocker therapy in heart failure using real-life data: A population – And insurance-based cohort. Pharmacoepidemiol Drug Saf 2015;24:406-13. Sato A, Suzuki Y, Saruta T. Effects of spironolactone and angiotensin-converting enzyme inhibitor on left ventricular hypertrophy in patients with essential hypertension. Hypertens Res 1999;22:17-22. Odwara M, Asano M, Yamashita K. Life – Threatening hyperkalemia caused by angiotensin converting enzyme inhibitors and diuretics. Diabet Med 1997;14;169-70. Rabinowitz L. Aldosterone and potassium homeostasis. Kidney Int 1996;49:1738-42. Young DB. 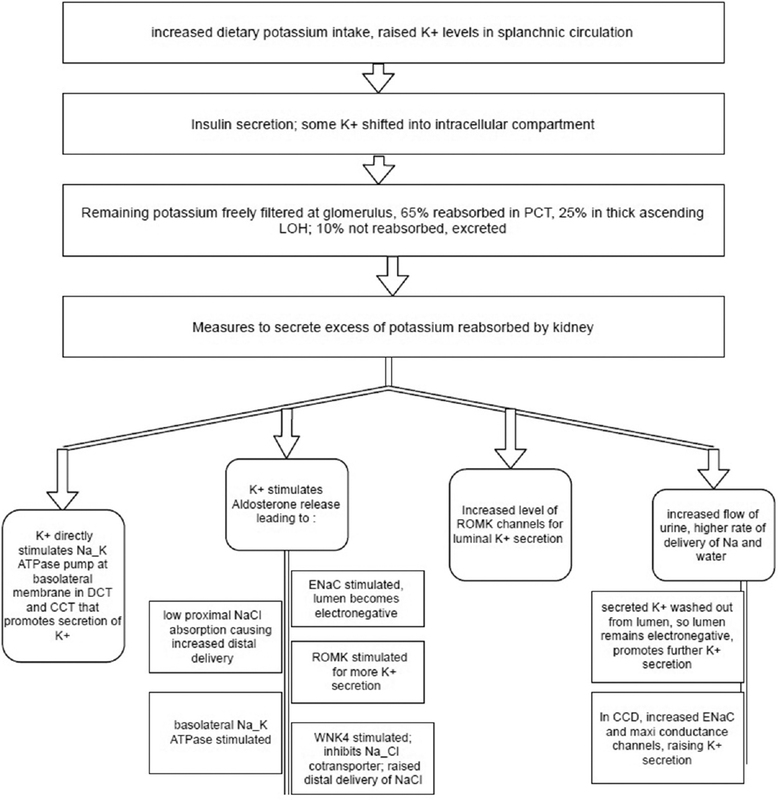 Relationship between plasma potassium concentration and renal potassium excretion. Am J Physiol 1982;242:F599-603. Rabinowitz L, Aizman RI. The central nervous system in potassium homeostasis. Front Neuroendocrinol 1993;14:1-26. Rabinowitz L, Sarason RL, Yamauchi H. Sheep renal potassium excretion: Efferent kaliuretic regulatory factors. Am J Physiol 1984;247:F520-6. Effectiveness of spironolactone added to an angiotensin-converting enzyme inhibitor and a loop diuretic for severe chronic congestive heart failure (the randomized aldactone evaluation study [RALES]. Am J Cardiol 1996;78:902-7. Dolovich L, Gavura S, Pottie K. Hyperkalemia associated with spironolactone therapy. Can Fam Physician 2005;51:357-60. Jarman PR, Kehely AM, Mather HM. Hyperkalaemia in diabetes: Prevalence and associations. Postgrad Med J 1995;71:551-2. Schepkens H, Vanholder R, Billiouw JM, Lameire N. Life-threatening hyperkalemia during combined therapy with angiotensin-converting enzyme inhibitors and spironolactone: An analysis of 25 cases. Am J Med 2001;110:438-41. Ahuja TS, Freeman D Jr., Mahnken JD, Agraharkar M, Siddiqui M, Memon A, et al. Predictors of the development of hyperkalemia in patients using angiotensin-converting enzyme inhibitors. Am J Nephrol 2000;20:268-72. Reardon LC, Macpherson DS. Hyperkalemia in outpatients using angiotensin-converting enzyme inhibitors. How much should we worry? Arch Intern Med 1998;158:26-32. Raebel MA. Hyperkalemia associated with use of angiotensin-converting enzyme inhibitors and angiotensin receptor blockers. Cardiovasc Ther 2012;30:e156-66. Carrisoza-Gaytán R, Salvador C, Satlin LM, Liu W, Zavilowitz B, Bobadilla NA, et al. Potassium secretion by voltage-gated potassium channel kv1.3 in the rat kidney. Am J Physiol Renal Physiol 2010;299:F255-64. Williams E, Fulop M. A puzzling case of hyperkalaemia. Lancet 2001;357:1176. Pavletic AJ. Hyperkalemia induced by excessive consumption of dried fruits – Manifestation of an undiagnosed eating disorder? Psychosomatics 2011;52:494-5. Miller KC. Plasma potassium concentration and content changes after banana ingestion in exercised men. J Athl Train 2012;47:648-54.